These are critical first steps to make sure your brass is sized correctly. If you are having problems with your first batch of brass, make sure you are following these directions precisely because if your brass is sized too short it will fail to fire, too long and the bolt will not lock into battery and you have a fail to fire. "Starting with LC 5.56 once fired brass. Does it go easily into battery (see photo)? Keep reducing the space between the shell holder and die and resize with a new piece of brass until your brass closes in the chamber without too much effort. Always be sure to keep the trim length to 1.690" which is max case length. The reason for using a new piece of brass each time is because the brass that you just sized will not want to move with the .002" bump that you create when reducing the gap. It will likely try to spring back to where it was on the first sizing. Just set it to the side and start with a new piece. From all of the load data that I have seen, the published data (not data from Joe Blow off the internet) from various sources are showing max loads for 6x45mm to be midrange loads for the Mongoose. I have been going half way between max and min for the 6x45, start my ladders there and work up. I have been ending up around a grain or two over max listed loads for the 6x45. As you all know, there is not a max length for it - aside from fitting into an AR15 magazine. You will have to determine where your length needs to be based on your projectile choice. We can't just load to 2.2XX" and call it good because some projectiles will be into the lands at a shorter OAL. You will need a modified case, or use some other method to determine where your projectiles hit the lands and load accordingly. One very important thing for any ammunition, hand-loaded of factory! If you have a loaded cartridge that does not go into battery, do not force it into battery. Something is wrong with it. set it to the side and take some measurements later. It could be a thick neck, loaded too long, jacked up case. Just don't try to force it to shoot. It can bite you!" Setting up your sizing die: Start long and adjusted sizing die down (less cartridge headspace) until the bolt locks up with little effort. 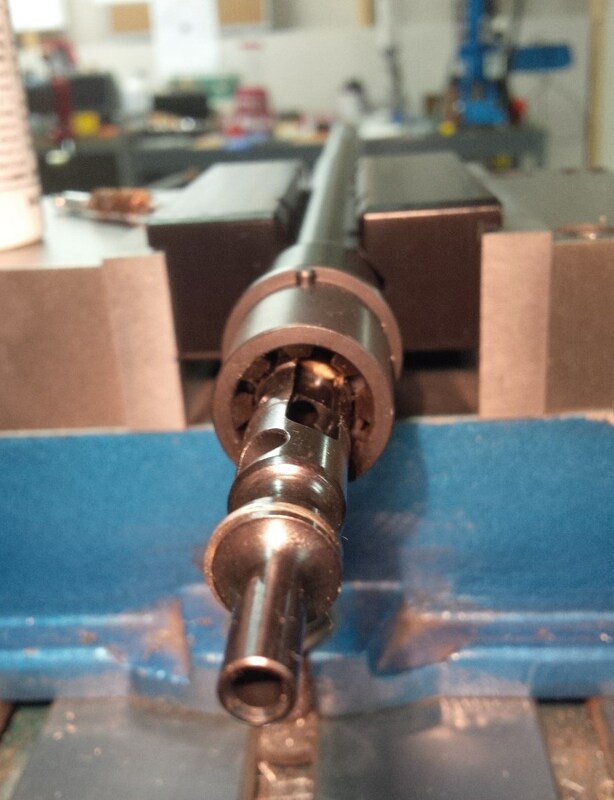 It helps to remove the ejector and extractor from your bolt for this step to get a more precise measurement, but its not all together necessary; I just feel its easier this way. One last thing... make sure you chamfer the inside case neck real good before seating a bullet! The 40 degree shoulder offers little support for any downward pressure on the neck, and if the cases have just been annealed its easy to collapse the shoulder while seating a bullet. Should I anneal the case first to make it more pliable, like the new brass? I've tried both ways, annealing before or after forming. Both have benefits and drawbacks. For fresh once fired LC or new brass, I would anneal, size, fire form, then you can reload again without annealing. Some find it easier to size first, then anneal... personal preference and what works best for your setup. Annealing first definitely reduces the spring-back, especially with GI brass, which yielded more consistent results for me. The down side is that shoulders are easier to collapse. Question and assumptions. I have begun forming Mongoose brass from the once shot stuff I got from Keith last week. I annealed some and left some alone during my first efforts. Questions: 1) When I form the brass I get a slight bell at the shoulder. Is this normal pre fire forming? I'm assuming so since no matter what I've tried it's still there. It is formed when the shoulder is pushed back and not by the expander button or lack of inside neck lube. That was the first thing I checked. No bell when only the button is run in the mouth. 2) I followed the above sizer adjustment procedure starting long and working down and found the die had to be run all the way down to a cam over on my Rockchucker for the formed and trimmed case to easily chamber. Unusual? That bell mentioned above did not seem to effect easy clambering. That's why I assume it's "normal" on initial forming. Oh, snd it doesn't seem to matter a bit whether the cases are annealed or not. The slight bell is always there. See the pic I attached. Here's a closer cropped view. The small bell is totally normal for first form, unless all the planets align for you... the final body/shoulder junction is wider than the original of the parent case. I can't speculate on your dies/press/cam without being there but you should have a little more wiggle room than that. So, should I anneal before or after initial forming? I noticed the expander button is noticebly easier to get through the neck if annealed first. That probably will minimize any springback issues I might encounter with fresh once fired brass. No need to anneal... go shoot it and your brass will be much, much better looking and performing. Annealing never hurts, just like checking your tire pressure every time before you drive. Larry - I've had more problems with collapsed cases when annealing before the initial sizing; therefore I've been annealing after forming for the Mongoose and Ocelot. I also have to trim my brass before sizing or I get problems. Each set of Mongoose dies are virtually "custom". As others have said - the "donut top" is perfectly normal and vanishes with the initial fire-forming. Happy New Year! LOL. Since I've never annealed anything in my life before that fits right in. Besides all I have is the backyard redneck inconsistent method using a drill, socket and propane torch. With LC brass so common I could care less about longevity. I probably have close to 2K unprocessed range pickup on the shelf already. And about 3K RP and WCC. One thing I noticed is this caliber looks a whole lot like a 6mm TCU except the TCU, like the 6x45, retains the 223/5.56 1.750 case length. I would recommend that you shave about .010-.015" from the bottom of the die to give better adjustment range, and to avoid having to cam over. All that does is put extra wear on the toggle bearing. Born today. 250 formed Mongoose from that 500 LC I won in the drawing from Keith. 250 more to be born soon. I forgot how much I hate forming, trimming and prepping brass. At least this is one step less than Wolverine. No cutting. Now to get the upper put together so I can load and fire form. That may be awhile though. I want to sponge camo this rifle using Aluma Hyde and it's going to have to get a lot warmer before I can. Decided I can't wait to put together the Mongoose. I was going to wait for warm weather so I could camo paint it. So, couldn't stand that long wait and I orderd a set of Gun Skins for it. I've never tried them before so wish me luck. They get lots of 5 star reviews so we'll see. DVOR had them for $50 so I couldn't resist. I want to load and fire form the newly formed LC's with those 55gr Dogtowns and what better time to do that than killing squirrels in March. Much more fun than killing paper and dirt.